Memory care settings may provide physical and emotional relief as well as peace of mind for families with a memory-challenged relative. 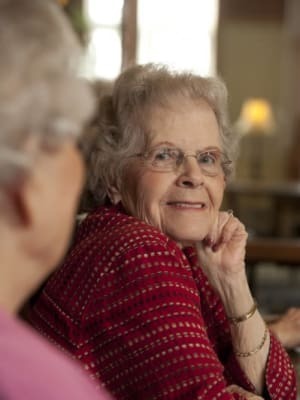 Memory care team members are educated in person-centered, elder directed dementia-specific training. Using empathetic communication, and validation techniques, they support each person as an individual, and a whole capable human - capable of love, laughter, and engaging in a meaningful life worth living. Evergreen Memory Care has a family-like atmosphere where residents can enjoy social and daily living supports in a beautiful atmosphere. We believe it is particularly important to maintain connections with one another, families, and to their own identify. Empathetic communication approaches to maintain self-esteem, and to attend to the basic human needs of each individual. Special attention is paid to nutrition, physical, social, and cognitive stimulation. The Circle of Friends(™) includes music, conversation, movement, and food. This ritual gives a sense of family and validation. Music Makes Memories(™) program stimulates the limbic brain, and helps each person maintain a sense of self and purpose and well-being.. Tiny Stories (™) allows us to record the stories we hear each day and capture them in audio recordings. The legacy of each person is maintained. #Gen2000(™) is an intergenerational program where teens and care team members facilitate a connection with family and memories through technology. For more detail on our programming, see our True North Programs.